This is my husband, Jerry and our two awesome sons. 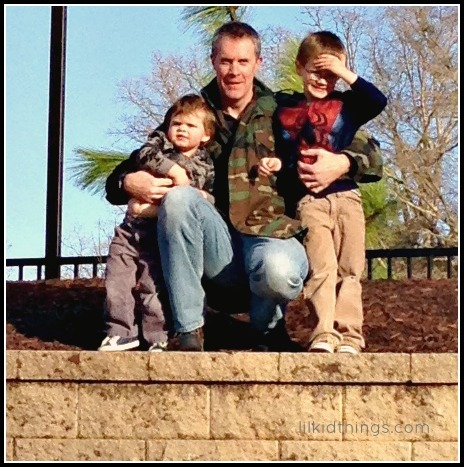 As the officially outnumbered gender in this family, I am learning all about taking care of boys. When we got married, Jerry and I started to divvy out the chores based on the things we hated most. He hates any and all shopping and I hate dealing with trash. Easy divide. To this day, I do 98% of the household shopping and that includes bath products. Over the years as I have brought home different brands, Jerry has come to love the men’s products from Dove. And believe me, we have tried many different brands! I try to find a balance between something he likes and a good value. The boys still use various tear-free formulas, but I know it won’t be long before they graduate to needing different products. And while hair care is important, I dare say this is the first time we have “songed” a shampoo. It’s not uncommon for someone in this house to break out into song when asking for a glass of water or getting ready for bed. But even I had to laugh on the night I told Jerry I would be covering this product when he immediately burst into song. It’s not just us ladies with different hair types and issues to deal with. It’s tempting to think guys don’t need to worry about all that stuff, but why? They face the same problems we do so a one-size-fits-all approach isn’t gonna cut it. Did you know Dove® Men+Care™ and Walmart have teamed up to offer the “Good Hair Guide” to help men find the right product for them? Research products based on issues from dandruff to sensitive skin. The products are cost effective and if I may say so myself, they smell great! I dare you to wash your hair without singing his little tune. This post is part of a sponsorship with The Global Influence Network. My #DisneySide is vacation planning!